Arthur River wends its way through the Tarkine (takayna), an area of World Heritage significance located in the North-West corner of Tasmania Australia. 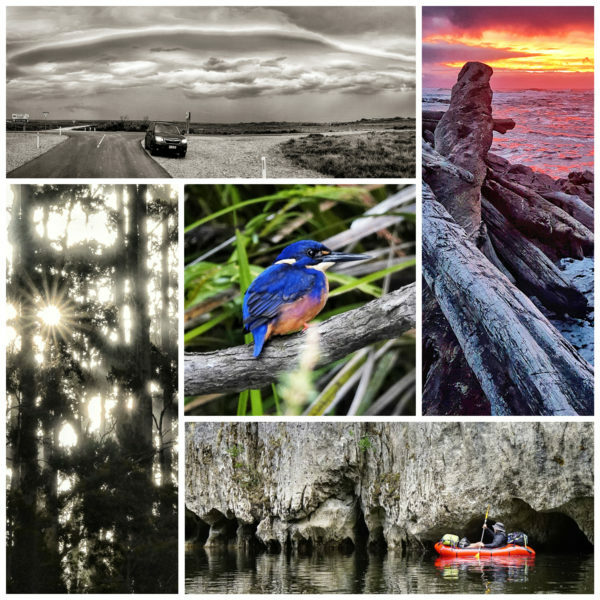 The Tarkine contains remarkable natural and cultural values, including being the world’s second largest remaining tract of temperate rainforest. Ironically it also remains Tasmania’s largest unprotected wilderness.We decided to experience the majesty of takayna first hand by packrafting the Arthur River no less! 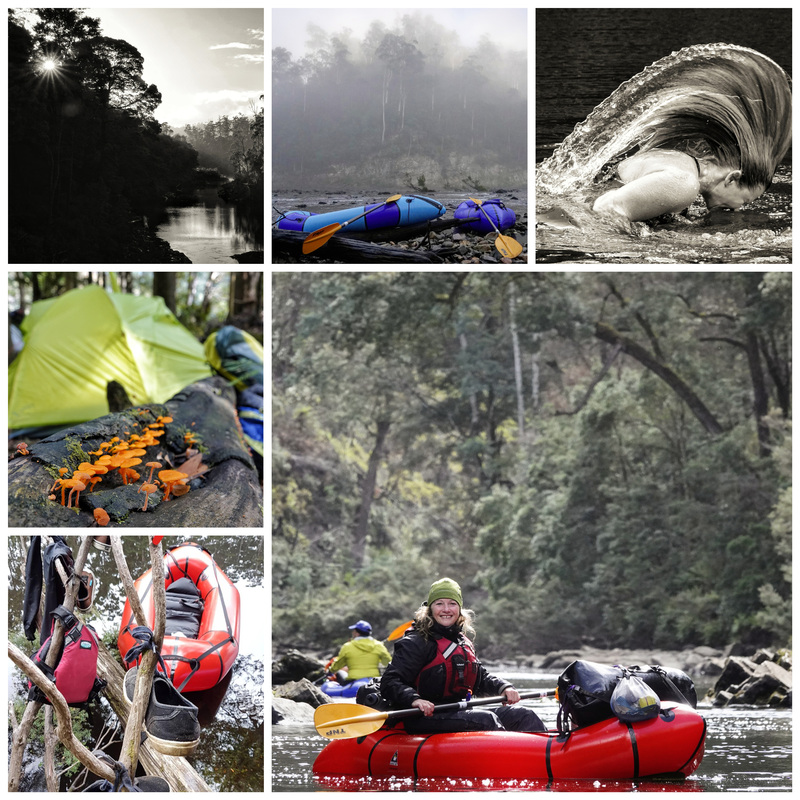 I was stoked when my partner Von mentioned the possibility of a multi-day North West Tasmania packrafting adventure. I’d only packrafted once before – on a flooding creek in North East Victoria several years ago. Admittedly it wasn’t a great idea by any stretch and almost ended in disaster. Still, I remember being smitten by these portable dodgem-esque water crafts, imagining all the ways they could extend adventure opportunities beyond mountain biking and hiking alone. One day maybe! The plan was for Von and myself to join three other friends and packraft the Arthur River from Blackwells Bridge to the sea ~120km over six days. With water levels relatively low after a dry Summer, locals suggested we drop in lower down the river at Tayatea Bridge cutting the trip back to ~80km over four days but minimizing portaging. It sounded like a good plan except for one small detail – we had zero packrafts. Pack Raft Australia to the rescue – thanks Ryan! Leading up to the trip it became clear the warm, dry Summer was about to come to an abrupt end. We’d be paddling into what looked to be the biggest storm of the Summer! The Arthur River has a huge catchment and can rise dramatically without warning, so it’s essential to be aware of the weather forecast. In our case the cold front looked to be more about extreme winds and cold temperatures than heavy rain so we figured it was game on. A massive storm front followed us all the way from the township of Arthur River to Tayatea Bridge, proceeding to unleash a torrent of wind and rain just as we arrived at the drop in point. It must have looked a sight to our two local shuttle drivers sheltering in the vehicles. Five out-of-towners surrounded by colorful waterproof packs standing silently in the pouring rain, staring at the five small cardboard boxes that would transform into packrafts and hopefully carry them and all of their gear down to where the Indian ocean meets Tassie’s north west coast. After clumsily working out how to strap what gear where off we went entering the water on the first sweeping bend. My memory of packrafting down a flooding river was reminiscent of a spinning top – chaotic fun, more than a little out of control! Much to my relief steering a fully loaded packraft has a lot more in common with pushing a shopping trolley around. Get it turned in early, slide it on through! With days to spare due to our shortened trip, we only paddled half a day before spying an excellent camp spot on a river bend complete with rounded pebbles perfect for skipping, ample soft sand and a grove of wattle saplings. Before long wet gear was hung out to dry, dinner was on the stove and wine began flowing. We were on our way! 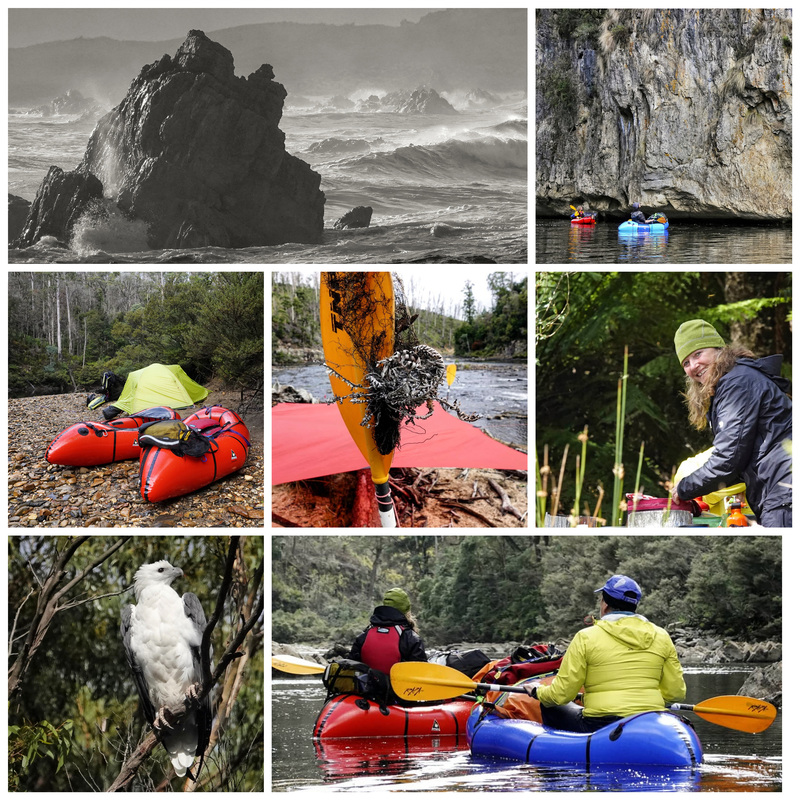 After a misty start to the day we headed down the river enjoying classic Tarkine scenery including massive riverside cliffs along with varying river and weather conditions. So peaceful to be out on the river, going with the flow and playing in the grade 2 rapids. All up a super fun day! After a ~25km paddle we arrived at Kannunah Bridge. With the worst of the storm front forecast to pass through overnight we set up camp in a picnic shelter up out of the river valley, securing the packrafts in the forest below. And what a night of wild weather it was! How fortunate were we to see it out inside a shelter instead of being down on the river. Cold rain, strong wind and hail were the order of the day! It was around now I regretted forgetting to pack my gortex pants. Yeah my legs got real cold, but as long as we were paddling I was warm enough. Stunning scenery though, along with fun grade two rapids here and there. Avoiding the many trees that have washed down the Arthur over the years kept everyone busy. Fortunately our total puncture count for five people over five days would be zero, and that also included boot scooting over numerous rocks due to shallow water here and there. Packrafts are far more durable than you’d expect. With the river now winding its way through steeply sided forested hills the challenge toward the end of the day became finding somewhere to camp. Bend after river bend offered only beaches of sharp rocks or pebble. Finally we spied a small beach with just enough sand along the banks to shovel into flat areas for our three tents. After a day of paddling ~25km in wild weather it felt great to be sipping hot chocolate in a sleeping bag, warm and dry! With only the occasional passing shower and wind gust it was a cruisey comfy day on the river. It was our last full day of paddling, highlighted by a scenic rocky gorge containing the most fun rapids of the entire trip …and bursts of sunshine! Not long after the river widened and we were at the confluence of the Savage and Arthur rivers. We probably should have collected more fresh water earlier in the day as it was well and truly brackish by now haha! There were campsites aplenty along the river set amongst giant man fern forests. With only half a day of paddling to go we got off the river early and enjoyed sunshine by the camp fire. After a lazy morning of sleeping in followed by pancakes we got on the river. Those brave enough had coffee on brackish water. Nothing like a salt water caffeine enema hey?! The final stretch was all flat water paddling into the wind providing a great opportunity to do some bird watching along the river banks, including floating past a white bellied sea eagle who didn’t seem at all bothered by our presence. Rounding the final bend before the Arthur River township it felt like the adventure was over way too soon. There were our two cars parked at the jetty, with the waves of the Indian Ocean crashing in the background. Before we knew it our packrafts were back in their cardboard boxes and we were on our way to a nearby pub for counter lunch reward. It was strange to be travelling in a car while my body was still moving to the flow of river. 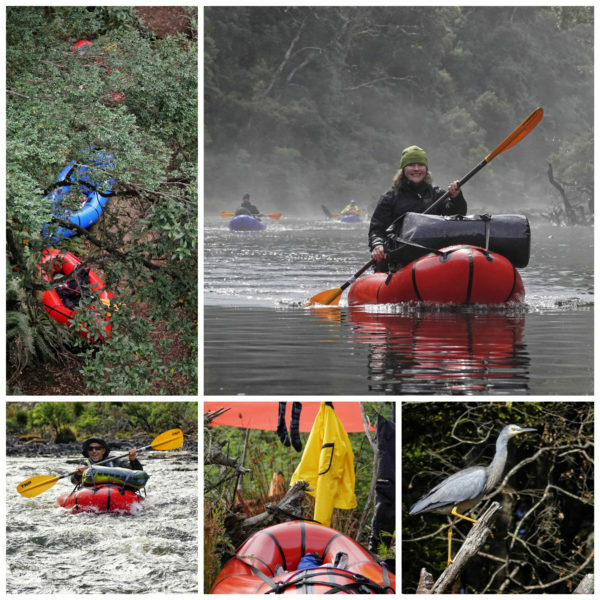 So how much did we love our Arthur River packraft adventure you ask? We decided to buy two of the rental rafts for ourselves, and look forward to many more days on the water. Tassie is full of great rivers waiting to be explored!